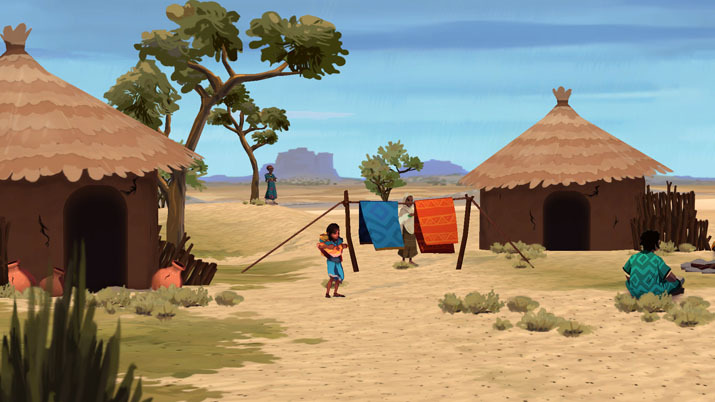 Inkline creates a beautiful adventure platformer with Ayo: A Rain Tale (Ayo), which sets out to increase awareness about the harsh and dangerous conditions girls and women in Africa face everyday when fetching water for survival. 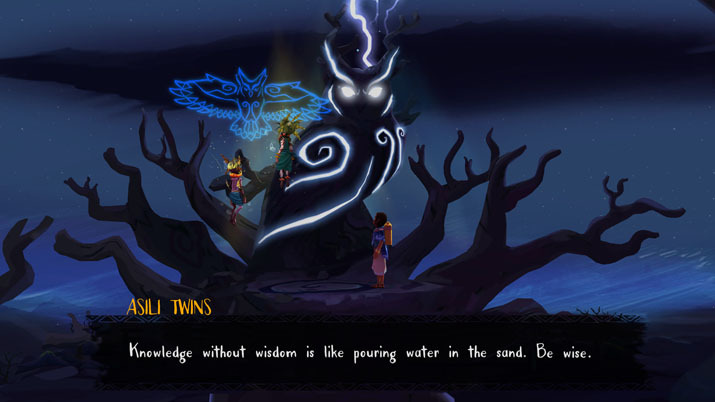 You play as Ayo, a girl who is sent on the perilous journey of H2O retrieval, and the many challenges you face underway are metaphorical for the real challenges that millions of people face every day in the real world. As beautiful as the message behind Ayo is — that something should be done to help ease or eliminate the daily struggles people face to retrieve water — it is also equally beautiful on the surface. I love the style of the vibrantly colored objects in the forefront contrasting with the scenic, desert landscapes in the background. Each level has its own distinctive elements, so there is a pleasant amount of variation. I found myself looking forward to advancing to the next level partly just to see what it would look like. One way the player experience could be improved is how the camera zooms in and out without any way to control it: if you move your character into a small space, the camera sometimes zooms in super close, only to zoom back out once you move back out into a larger space. The constant zooming in and out was irksome and it and even made me a little queasy. The camera is otherwise stable, though, so I was able to pull through. Still, I would much prefer if there was a way to zoom yourself, or if the camera stayed at a constant distance the whole way through. There were times when it was inconvenient to have the view zoom in close, because I couldn’t see where the next platform was to jump to, or keep an eye out for monsters to evade. A few times, the zooming caused me to die, which was frustrating because it was outside of my control. A seemingly impossible task… by design? One great aspect of the game is that it constantly changes as you advance, unlocking special powers such as digging or jumping super high. These new tricks change how you play, so you likely won’t feel like you’re so used to the mechanics that it gets boring. There are some weirdly difficult maneuvers you are expected to pull off occasionally. Difficult obstacles pop up after easy ones seemingly at random, which can be confusing. I spent quite a bit of time simply thinking there was no possible way to make progress in the third level and feeling very confused, until I finally pulled off an extremely tricky move that I wasn’t even sure was possible. Perhaps this is intentional and metaphorical, as it requires that you persevere in the face of a seemingly impossible task — but if that is the case, I think it is still too difficult as it hinders enjoyment of the game. I played Ayo for three hours and reached roughly the halfway point. In each level there are water droplets for you to collect that can be easy to overlook or difficult to obtain, so there’s material for several playthroughs. Indeed, you might have to replay some levels multiple times anyway if you want to achieve the perfect score by collecting all of the water. Ayo shares with its audience a sincere message encapsulated by game, and continues the progression we have seen recently of video games used as a vehicle beyond the immediate capacity for ‘interactive entertainment.’ Despite a clunky camera and some problematic puzzles, this platformer boasts a solid foundation, with promise of several hours of enlightening fun.